Agents of Justice: War of The Worlds Featuring Voltage. When a group of Martians attack various cities around the world, Lady Justice summons a team of superheroes to stop them including the extremely powerful, Voltage. 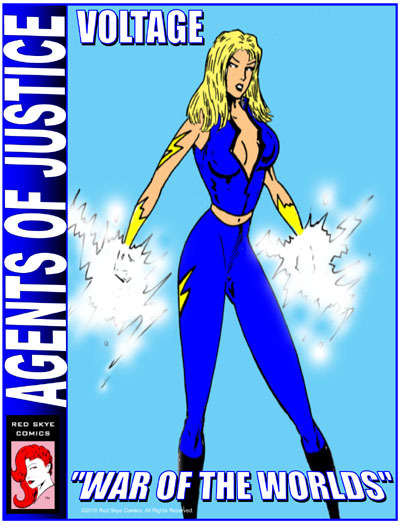 Agents of Justice: Voltage featuring Elise Natalie is 20 pages with full color cover and b/w interior art. About Elise Natalie: Elise Natalie is the World Titleholder and Official Ambassador for Tropic Beauty Model Search, one of the most prestigious swimwear and calendar model search competitions in the world. She has featured on three magazine covers this year alone - Kandy Magazine, The Blur Magazine and Natural Bikini Magazine along with features in other magazines and popular online sites including Fox Sports, Ellements Magazine and The Bro Bible. With her goals aimed high, she is currently pursuing careers in television presenting and acting, having already been a host for a Fashion Show in New York in 2014. Last year she was featured as BikiniTeamTV.com's Model of the Month for March, secured an appearance as a bikini model on Bikini Destinations TV in Puerto Vallarta, Mexico and was cast as a lead in three short films in Australia. Help support the Elise Natalie featured model page - You Can Donate Any Amount!